A new synagogue has been opened in the heart of the German city of Munich, 68 years after Nazi dictator Adolf Hitler ordered its predecessor torn down. 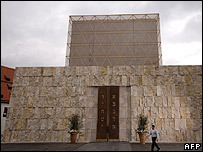 The sacred Jewish scrolls of the Torah were paraded through the streets to the cubic building in the city centre. The new synagogue is seen as a symbol of the rebirth of Munich's Jewish community, which was all but wiped out by the Nazis in World War II. The ceremony came 68 years after the Nazi Kristallnacht anti-Jewish pogrom. Kristallnacht - "night of broken glass" - was a nationwide wave of assaults on Jews and their property in Germany that preceded the Holocaust. German President Horst Koehler was among hundreds of officials and religious leaders at the synagogue inauguration on Thursday. The synagogue bears the name of its predecessor - Ohel Jakob (Jacob's Tent). 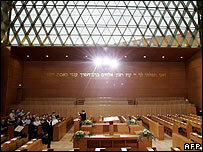 Construction of the synagogue, along with a Jewish community centre and museum, cost 71.5m euros (£48m; $91.4m). Some 9,300 Jews now live in Munich - the country's second largest Jewish community. At the ceremony President Koehler warned that "still today our dream of a normal Jewish life in Germany clashes with the reality that there is open and latent anti-Semitism and the number of violent acts motivated by right-wing extremism is rising". "It is the duty of all of us to get involved and act to prevent people being abused, injured or even murdered due to their religion, origin or appearance," he said, quoted by Reuters news agency.